Originally made for the Princess in May 2011. Well, the oldest was going to be six and she knew exactly what she wanted for her birthday cake. 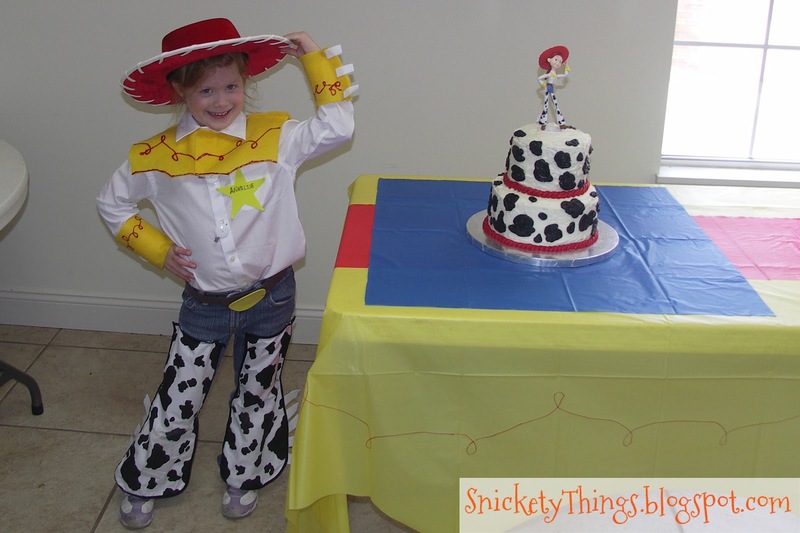 She handed me a Jessie (from Toy Story) and said "This should be on top of my cake. Do your best, Mom." She is getting a bit more precocious you see. I had originally thought I would make her cake look like Jessie's hat, but this was going to be a little more difficult now. Or was it? Suddenly I had inspiration. What is Jesse? She is a cowgirl and cowgirls mean cows. Cow prints are easy. Really easy. 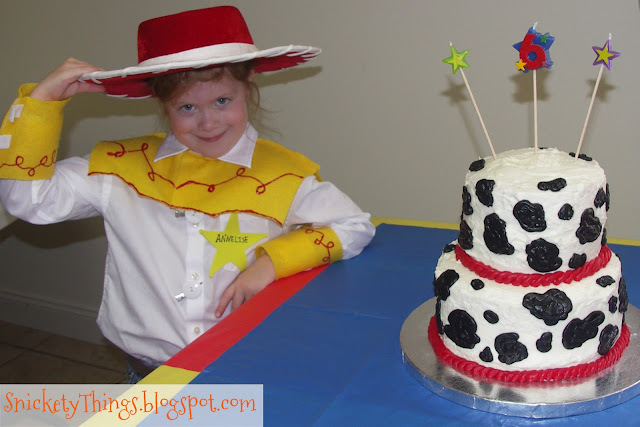 And, I had already did a cow print on the top of her Fancy Nancy cake. I chose to do two six inch layers and two eight inch layers. They were iced in all white icing. I used two tubes of Wilton black to do the spots. I know it seems like cheating to use pre-made icing on top of my homemade butter cream, but it really beats trying to make black yourself. The black spots were made using a Wilton #7 tip then smoothing it out (sort of) with my finger dipped in a little powdered sugar. 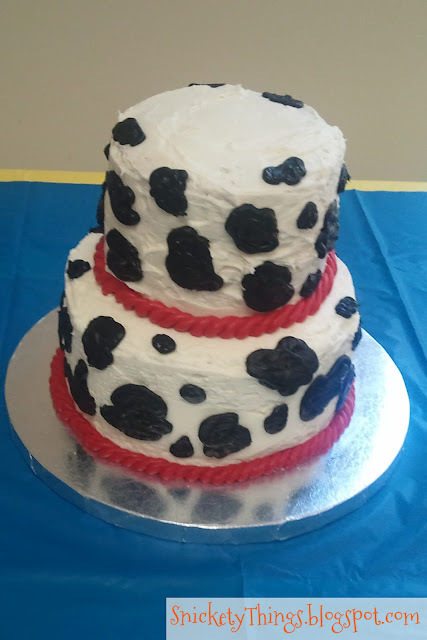 I used a tube of Wilton red (still easier than making red, too) to do a rope around the sections of cake. I used a Wilton #6 tip to do this. The Princess was thrilled with how it turned out. Here she is in her Jesse costume (I made that, too!) posing like Jessie on the cake. When it was time for the candles, I removed Jesse and put in the cool little star candle set I found at a local party supply store. You will probably see the rest of this party soon. This is too dang cute! great job on the cake! This is the cutest thing I've ever seen!!!! GREAT JOB!!!! That cake looks great! The costume is also perfect...you are a great mom! The cake and your daughter are adorable. The design is just right for Jesse. I'm glad it ended up how it did. I don't think I could have done the hat justice. Thank you for coming by! Hi! Found you on Chic On A Shoestring Decorating party! Love the cake! My son had a Toy Story birthday two years ago and I made cupcakes to look like Hamm, the aliens, Mr. Priclepants and did cookies to look like Jessie's hat. I was so tired of making cupcakes when I was finished! Have a great weekend! I would love to see pictures of those cupcakes. Thanks for stopping by! That is such a great cake!!! Great job! What a GREAT cake! I just made my niece a Jessie costume in the fall and now I am holding on to this too...I know it will be perfect for her :) Going to start following you now! Thank you! I hope your niece enjoys her costume! That is too fun! You did a great job on the cake! And she is just too cute in her costume...bet she loved it. Thanks for sharing at Shine on Fridays! What a great cake! Thanks so much for sharing at Scrumptious Sunday! So cute! 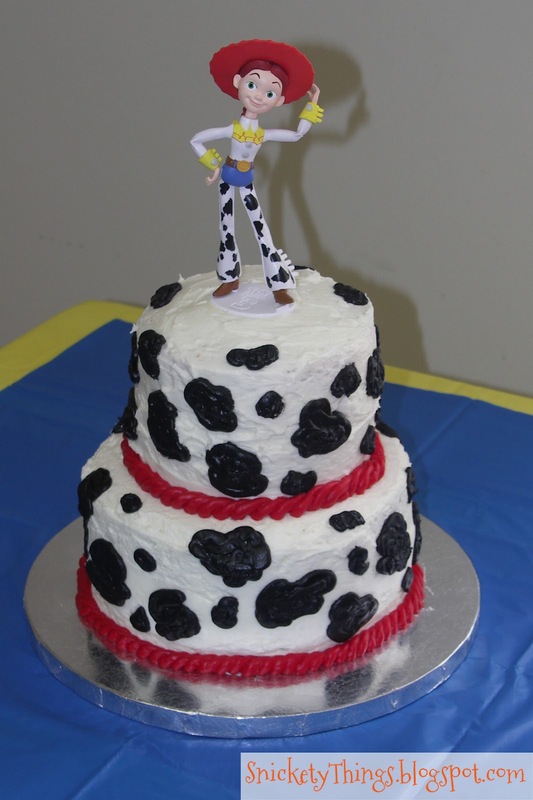 I love the way the rope looks around the edge of the cake. Your little girl is just too cute posing. Thanks so much for sharing at Whimsy Wednesdays!